To unfreeze your video’s view count fast, simply select the quantity of views you would like to order and press the “Add to Cart” button. Unfreezes Videos Stuck at 301 Views in 24-72 Hours! Do your views come from real people? Yes, the views we use to unfreeze your YouTube videos come from 100% real people! Will your views unfreeze my video? Yes, that’s the whole point of this service! Our views will unfreeze your video within 24-72 hours and will of course increase your view count by more than the quantity you had ordered. We always over deliver, every time! 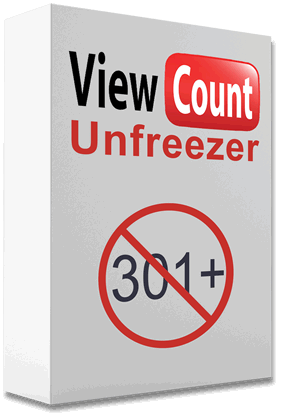 If you do not want to wait 2-6 weeks for your view count to unfreeze, then our “Unfreeze YouTube Views” service is exactly what you need. How long does it take for my video to start gaining views? You will start seeing results appear within 24-72 hours. YouTube does not update the view counts live, so we typically start delivering the views within 1-5 hours after your order is placed and then are done delivering them within 10 hours. After we are done delivering them, we simply have to wait approximately 24-72 hours for YouTube to update the view count. What is the minimum number of views I can order for a video? The minimum order quantity is 1,000 views per video. If you order 5,000 views, you can split that up between 5 videos, but you cannot split up 1,000 views across multiple videos. good job on providing YouTube Views. Awesome work at unfreezing my video. i got 60 views in 15hr. We are glad that you like our services!